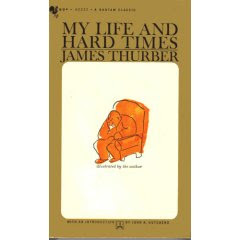 My favorite story in this particular set was "Draft Board Nights" in which Thurber relates how he was never drafted as a soldier due to his bad eyesight. However, apparently his paperwork was never processed correctly and he was called back, time and again, to the draft board for examinations -- eye exam always occurring at the END of the examination. Week after week he was called in for examinations and, of course, he went. He finally started posing as a doctor and was doing examinations himself unnoticed and undetected. Interestingly enough, in doing a little research on Thurber, it would seem his bad eyesight came about under rather unusual circumstances. When he and his brother, William, were playing a game of William Tell, his brother shot him in the eye with an arrow causing him to lose an eye. Thus, he had poor eyesight and the injury caused almost total blindness when he was older. I find it fascinating that he gives no hint of this occurrence in this book. As a result of his eye injury, he was unable to play sports with most children and developed his imagination instead-- eventually releasing his creativity on paper. Aren't we thankful that happened? I think this book is a powerful testimony to someone taking what could have been viewed as a very bad situation and turning it into a positive - in this case, humor. Amazon.com reviewers all seem to give a thumbs up to My Life and Hard Times("buy this book and treasure it") and I'll add my thumbs to the crowd. Thurber is more of a subtle humorist than Erma Bombeck, kinda in step with Patrick McManus, in the same time period as Wodehouse and is sure to guarantee at least ONE laugh as he is as all the rest: a humorist. And those people seem to have a knack at tickling everyone's funny bone. Even if just a little. I've only read his children's stories, and "Secret Life of Walter Mitty," but I love Thurber's imagination. I had no idea he lost an eye... kind of like Beethoven losing his hearing, but on a smaller scale! Interestingly enough,while I still avoid Walter Mitty at all costs, I fell in love with his short stories about six years back and have had my students read either "The Unicorn in the Garden" or "The Catbird Seat" every time I teach a Lit class. Good for you for researching the eye accident. I had learned he had poor eyesight but had never delved into the cause. I'll have to grab a copy of this book to read.